The rusty poing of a spring punctuates the white cube. It emanates from a black box theater—one of many dark enclaves in Tala Madani’s “Corner Projects,” the artist’s first New York show at 303 Gallery. The violent looping film, The Audience, serves the anchor of the exhibition. It consists of back-to-back animated narratives that appropriate the figures of Madani’s brushwork and turn them into actors in a surreal but equally twisted plane. Take for example, the aforementioned sound which accompanies a sequence where a defiant, finger wagging hand is worn down to a fisted nub by the repetitive punctures of a pointed spring end. The bleak images of The Audience spill out into the light filled gallery which contains a suite of new paintings. Here, the artist shows off her skill for creating beams of light in a sea of darkness. The panes of Mary Manning’s exhibition, “Love,” work in concert. 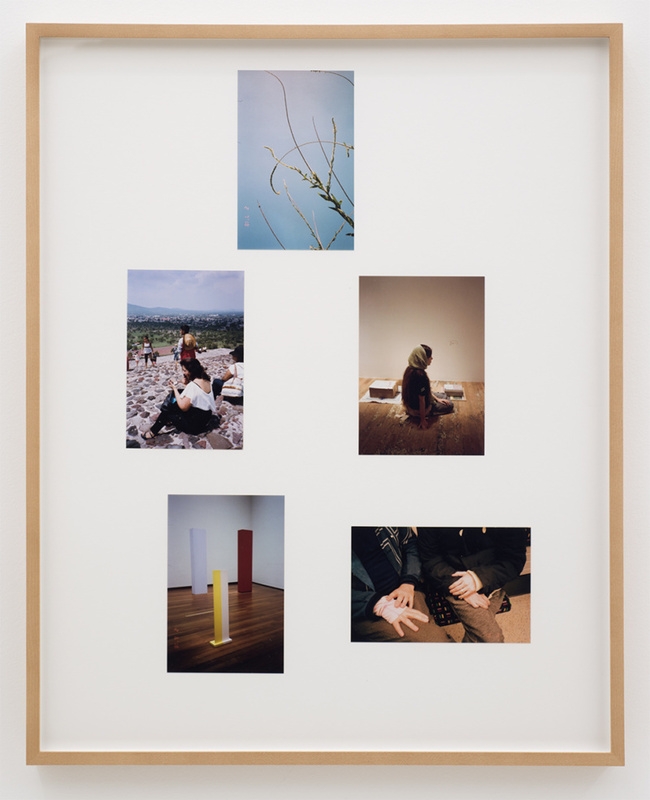 Her photographs framed preciously, and sometimes as collages, string together to form an apparition of an amorous observer—a tender eye turned towards the sun spot on the far wall. Her portraits of recognizable friends, Diamond Stingily and Monique Mouton, form a kind of inner circle—a living language that points back to the intricacies of chance and what beauty can be extracted from the everyday if we only looked closer. “Love” takes the casual candor of contemporary photography and makes it feel special once again. 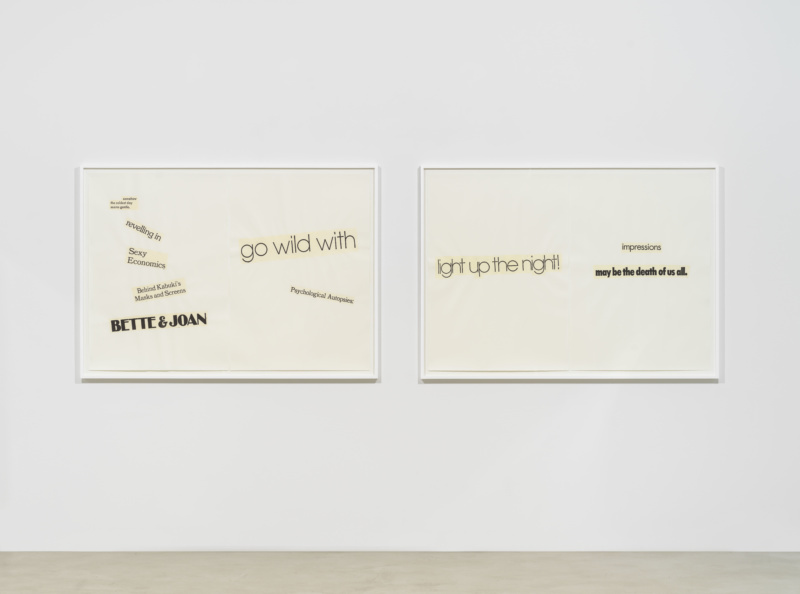 Installation view of “Sable Elyse Smith: BOLO” at JTT, New York. Photo by Charles Benton. “Did I ever tell you about the first time I killed somebody?” The cackle of Julie Hagherty’s ladylike voice penetrates “BOLO: Be On (the) Lookout,” Sable Elyse Smith’s JTT debut. Played on a six channeled screen hanging over a corner of linoleum, Room One: The Watcher features Hagherty reading aloud from Clockers on Conan O’Brian. It’s a part of a late night gag playing on Spike Lee’s open audition for the crime drama’s lead, Strike, ultimately landed by Mykai Pefier. The joke is that Hagherty is too innocent to play a criminal. This dark loop is echoed by walls filled with oversized coloring book pages scribbled with imagery from detention centers. The juxtaposition of comedy and tragedy come together to paint a layered image of the prison system that follows tightly on Smith’s Queens Museum show. 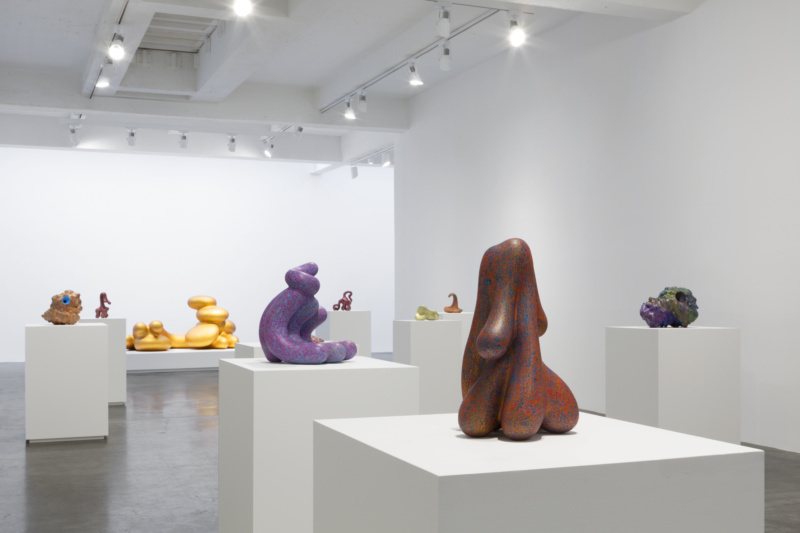 Installation view of Ken Price at Matthew Marks. Even posthumously Ken Price delights. Held up on pedestals, the late artist’s clay sculptures look like little flecked beasts made from gobby hills and valleys. Vaguely representational, the works stems from Price’s last two decades and as a result are some of his most compellingly intricate. Milling between the columns, one can get lost in the sculpture’s psychedelic details which feel as organic as they are bombastically contrived. All hail the indoor sculpture park. Installation view of “1076 Madison.” Courtesy of the artist. Frank E. Campbell Funeral Chapel on Fifth Avenue has born witness some of this and last centuries’ most talked-about services from Jackie Kennedy and Norman Mailer to Jean-Michel Basquiat and Heath Ledger. 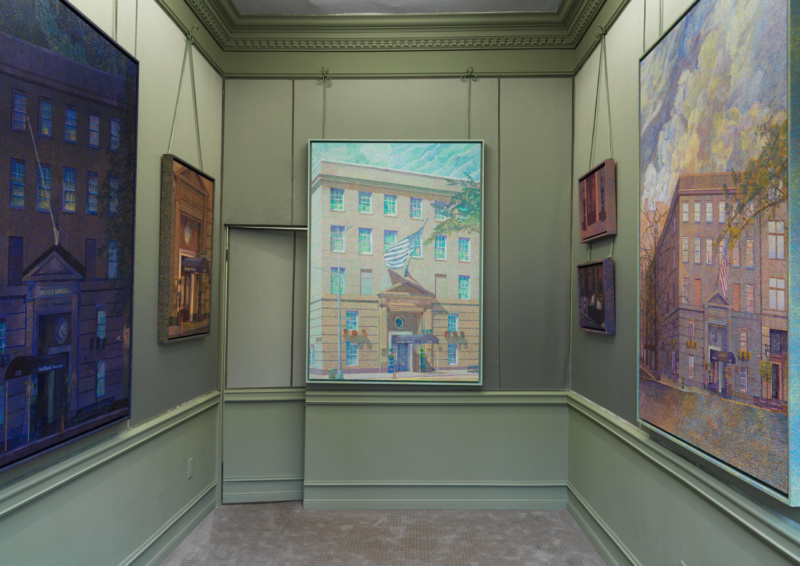 The funeral home plays muse for Cynthia Talmadge‘s transformative second exhibition at 56 Henry, “1076 Madison.” The show is the artist’s first major exhibition of paintings. 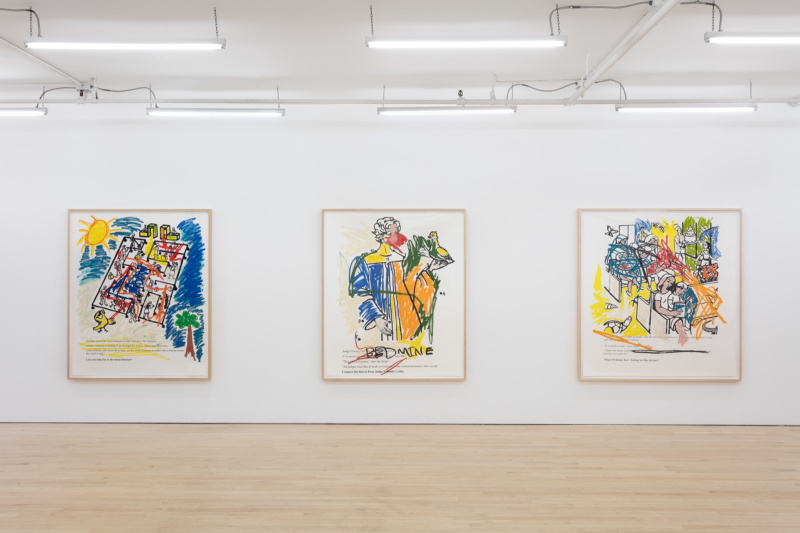 Done in an impressionist style, the paintings, which draw upon the facade of the New York landmark, gild the memory of the morbid icon much in the same way her first show glamorized the dorms of rehabilitation centers. Executed with the help of Charlap Hyman and Herrero, “1076 Madison” examines our desire to decorate death.